When you’re considering sending artwork through the mail, the first thought that comes to mind is the safety of your prized prints and paintings. Whether large or small, framed or unframed, mirrors, paintings or any other work, each requires special care to arrive intact at their destinations. There are two main methods of crating and packaging art for shipping which are commonly utilized – wrapping and bracing or crating. Wrapping smaller-framed or unframed art can help to keep it safe during transit. The ideal material for wrapping is acid-free tissue paper, which helps protect the image from the elements during shipping. A great tip is to fold four pieces of tissue into small triangles which can help provide additional protection to the corners of the image. For additional moisture protection, wrap the entire piece in plastic wrap as well. Lay a few layers of stiff cardboard over the front and back of the piece, and then tape those pieces together to create a hard shell over the artwork, which can then be surrounded with bubble wrap to protect the art and prevent dings to the frame while it is on its way. Finally, using corrugated cardboard, cover the front and back of the artwork and tape them together. Use this as a “shipping box” to attach your label, and, of course, a “Handle with Care” stamp! You can also build or purchase custom wood crates that offer superior protection for larger pieces of art, mirrors and other fragile works. 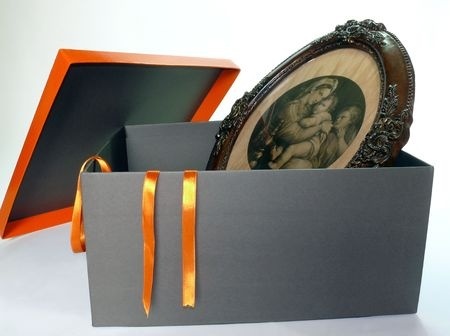 A handle can be attached to the crate to make it easier to carry, but there are some very important things to remember when using this method to ship framed and unframed art. We recommend using a cabinet handle from the hardware store, and be sure to double check that you’ve tightly screwed the handle into place. Use screws that are large enough to fit very securely; you don’t want the handle to fall off while someone is using it to carry the crate. Never use packing peanuts or other loose packing materials, though, which will settle inside the crate and provide very little protection. They’re also a hassle for buyers who have to unpack and repack artwork. Shipping art can be a hassle if you don’t know these two methods, but now that you do, you’re ready to ship framed and unframed art of any size. At L.A. Frame, we can help you make sure that your precious artworks and large hanging displays arrive at their destination. With our comprehensive pack-and-ship services, bring us your piece and we’ll make sure it gets to where it needs to go. Contact us today for more information!